Tackle everything from sidewalks and driveways to large commercial areas with the powerful but compact Deluxe 24. User friendly features like Auto Turn steering, electric start, remote chute control and in-dash headlight. Heavy duty, all steel construction for years of dependable performance. 205° remote chute and deflector throws snow up to 50 ft.
Deluxe 24-inch 254cc Electric Start Gas Snow Thrower Tackle everything from sidewalks and driveways to large commercial areas with the powerful but compact Deluxe 24. User friendly features like Auto Turn steering, electric start, remote chute control and in-dash headlight. Heavy duty, all steel construction for years of dependable performance. 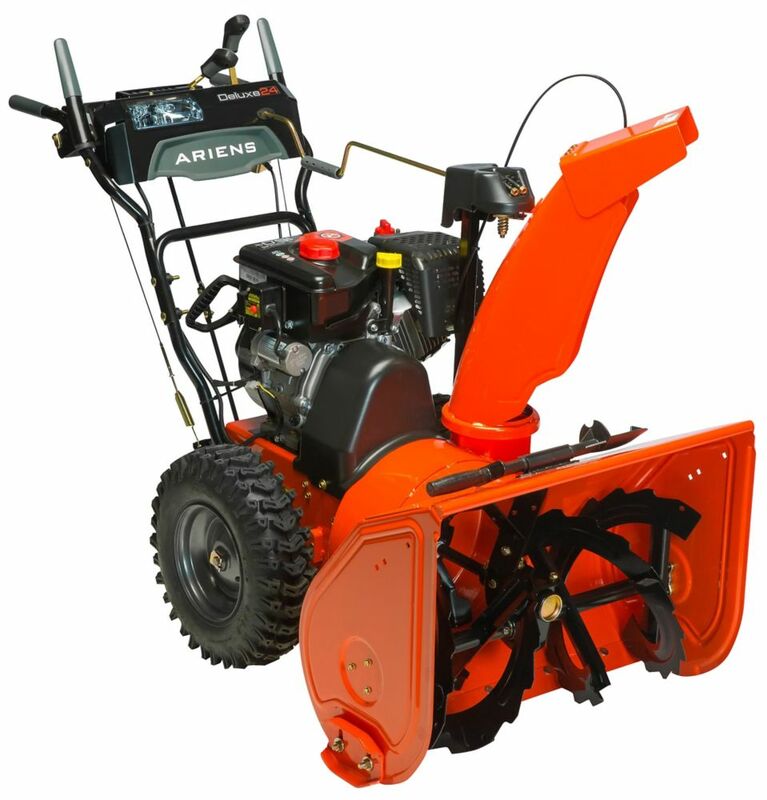 Deluxe 24-inch 254cc Electric Start Gas Snow Thrower is rated 4.5 out of 5 by 214. Rated 5 out of 5 by Clarence from Although I have not used it to remove snow because... Although I have not used it to remove snow because I bought it after the season, It seems to be a good purchase and should work a lot better than my 40-year-old snow thrower. Rated 5 out of 5 by Grolds from Through wet snow and slush 30'-40' without a problem. Impressive!... Through wet snow and slush 30'-40' without a problem. Impressive! Rated 5 out of 5 by Kerry from Only have been able to put it together and start... Only have been able to put it together and start it up. Fired up on the very first pull and tested perfectly. Rated 5 out of 5 by Free50401 from Awesome!... Awesome! Rated 5 out of 5 by NorthNJ from I purchased it in Dec 2107 and have now used it for two NJ winters. Cleans all types of snow espe... I purchased it in Dec 2107 and have now used it for two NJ winters. Cleans all types of snow especially good for wet heavy snow we often get in NJ. We have a 80 ft long sloped driveway and this self propelled heavy duty machine makes it look easy. This thing is a snow cleaning monster!!! Rated 5 out of 5 by Quinn from Recent acquisition. Easy to handle. Fast start. Smooth operation. Easy-to-understand instructions... Recent acquisition. Easy to handle. Fast start. Smooth operation. Easy-to-understand instructions. Home maintenance not a problem. Exceeds my expectations by a mile! Rated 5 out of 5 by BadBulb from so far so good. so far so good. Rated 5 out of 5 by Naughty from Best blower I've ever owned. Best blower I've ever owned.